Astonishingly, 77 percent of mothers in the US breastfeed their newborn babies. I would have suspected the number was far lower, due to the intolerance of public breastfeeding that still exists in some parts of the country, and I am partially correct. 77 percent of mothers breastfed their babies in the first month of life, according to a survey results from the Centers for Disease Control and Prevention(CDC). This is up from 60 percent in 1994. “The report shows that the initiation of breast-feeding is at an all-time high,” said Karen Hunter of the CDC. The American Academy of Pediatrics and the American College of Obstetricians and Gynecologists recommend that mothers breast-feed exclusively for the first six months of their child’s life and continue breast-feeding with baby food as a supplement until at least the child’s first birthday. The World Health Organization and the American Academy of Family Physicians also recommend six months of exclusive breast-feeding but suggest supplemented breast-feeding until the child is at least 2. Both of my children were breastfed until they were well over three-years-old. Breastmilk is the perfect food for a newborn baby. The benefits of breastfeeding for at least the first year of life are numerous to mother and child. Breastfed babes have stronger immunes systems, higher IQs, less allergies, less ear infections, less anxiety, etc. Breastfeeding may also prevent some forms of breast cancer in the mother. Breastfeeding promotes a close bond between mother and child. It benefits the environment too! Most importantly, breastfeeding saves lives! Breastfeeding rates are amongst the lowest in families of low economic status and mothers under twenty-years-old. 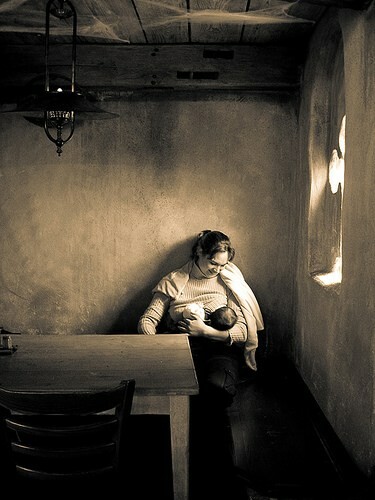 The improved statistics on breastfeeding are likely a result of doctor’s educating their patients about the benefits of breastfeeding; however, most hospitals send parents home with free infant formula, sometimes in a diaper bag. “That’s a problem because at least five studies have shown that when a doctor or nurse hands the family that bag, even if they take the formula out, that mother will have less success with breast-feeding,” said Dr. Barbara L. Philipp, associate professor of pediatrics at Boston University. Ban the Bags is a campaign to stop hospitals from distributing free infant formula to all new mothers. There are many risks associated with infant formula, including BPA leaching. By stopping the inadvertent promotion of formula feeding by sending it home with new mothers, it is hoped that breastfeeding rates beyond the first month of life will improve. Of course, I do believe that free infant formula should be available upon request, but only after much support has been given for the initiation of breastfeeding. La Leche League is a great resource for pregnant women, mothers, and all women interested in breastfeeding. The mother-to-mother support for breastfeeding (for free!) can be very helpful. It’s also very beneficial to simply be in a place where breastfeeding is the norm. I’ve heard from a lactation consultants that many mothers attempt to breast feed and then give up within a couple months due to complications. There seems to be more and more support available to breastfeeding mothers, helping them overcome hurdles. The more accepted breastfeeding becomes, the more support women will have to stick with it when challenges arise. I breastfed both my children and found it a wonderful and connecting experience with both of them. I fed them as long as they required me and was able to do this as I was not a working mother (having given up work to have my kids). I totally understand those that choose not to breat feed or have problems with doing so, but thankfully there are some great midwives and child practitioners out there with the experience and knowledge to give the support and advice needed. And the Winner Is Jan Barker!